On a chilly day in 1979, Michael Tang ’76, P ’13 found himself at the end of the world. He’d arrived in Ushuaia, Argentina, the southernmost city on the planet — dubbed “El Fin del Mundo” by inhabitants — after traveling by Jeep down the entire western coast of South America. Tang’s innate curiosity has led him from his home city of Chicago to destinations around the globe — from the Navajo Nation in Arizona to the steel mills of Detroit to his father’s birthplace in China. As CEO of National Material L.P., a highly diversified company that supplies steel, aluminum and other materials to industries worldwide, he’s rarely in one place for more than two or three days. “It’s critical to be able to interact with people face to face. Skyping doesn’t do it,” he says. The downside: air travel is no longer the glamorous experience it once was. “Getting on a plane nowadays is like taking the bus,” he says with characteristic humor. During all his globetrotting, Tang has been anchored by the constants in his life, above all his family, including daughters Michelle ’13 and Mariel — as well as his affection for his hometown and his alma mater. “He loves William & Mary and he loves Chicago, in that order,” says Judge John Charles Thomas, who served with Tang on the W&M Board of Visitors. Tang ended up living next door to another economics professor, David Finifter. “I’d have questions and go over and knock on the door,” he says. “He’d say come in, and would help me out. That’s pretty cool stuff.” Finifter, now a professor emeritus, went on to establish William & Mary’s program in public policy. Tang made his first gift to the university to help the program get started. As he reveals, it took some time to get up to speed with Southern culture. Shortly after he arrived, Mary Miley Theobold invited him to a Kappa Kappa Gamma dance. “I was set up with a date and I borrowed a car,” he says. “I got out of the car and started walking toward the student center. I walked about 50 feet or so, and I realized that my date wasn’t coming out of the car because I hadn’t opened the door for her. It was a total etiquette faux pas,” Tang says with a laugh. An excellent student, Tang was inducted into Omicron Delta Epsilon, the international honor society in economics. But he also found time for extracurricular activities. “He was always interested in photography and took pictures throughout college,” says Theobald. “When I got married in the Wren Chapel in 1974, my father asked Mike to take the pictures for the wedding.” Tang became both business manager and photo editor for the Colonial Echo, and his photos appear throughout the 1976 yearbook. From Williamsburg, Tang made the relatively short trip to Washington, D.C., for law school at Georgetown. He then wanted to take a break after so many years of rigorous study in a structured environment. “I shipped a Jeep to South America and I circumnavigated the continent,” he says. “I drove all the way down to the tip, as close as you can get to Antarctica, then drove back around through the Amazon and ended up in Caracas, Venezuela.” Tang drove more than 20,000 miles on his six-month journey. His next stop — Arizona. “Curiosity drove me,” he says. “My first job as a lawyer was for the Navajo Nation. I lived on the reservation. There were huge cultural and economic differences,” he says. Tang spent about a year and a half with the Navajo, then took a more traditional job practicing law in Phoenix. In 1982, he received an invitation from his father, Cyrus, to return to Chicago and join the family business, Tang Industries. One of Tang’s first experiences with the business involved negotiating the purchase of a steel mill in Detroit. Tang ended up moving there to continue working in the mill. “It was another culture shock,” he says. “I’d been living on an Indian reservation in Arizona with beautiful wide open skies and wild horses roaming. Then all of a sudden I’m living in Detroit, where there are smokestacks and an incredibly heavy manufacturing environment.” But his inquisitive nature and drive led him to make the most of the experience. Not surprisingly, Tang Industries today is made up of a wide range of diversified businesses. Tang currently serves as vice chairman of the parent holding company and CEO of its industrial group National Material L.P. (NMLP). One of the nation’s largest metal suppliers, NMLP comprises more than 30 business units with locations in the U.S., Canada, Mexico and China. It conducts business throughout the world, serving industries as varied as automotive, aerospace, construction, agriculture, electrical energy and defense. In his home city of Chicago, his service includes membership on the boards of the Field Museum, University of Chicago Medical Center and the Chicago Community Trust. He also is a trustee for two of his family’s charitable organizations: the Cyrus and Michael Tang Foundation and the Cyrus Chung Ying Tang Foundation. In addition, he is involved with the RAND Corporation, the nation’s largest think tank, and is a member of the National Defense University Foundation. His involvement with William & Mary has also been extensive, beginning in 1990 with an invitation to join the Endowment Association (now the William & Mary Foundation) — a time when the university had just embarked on its first large-scale fundraising campaign, the Campaign for the Fourth Century. Tang went on to serve a four-year term on the W&M Board of Visitors, from 2009-13. He and the newly appointed rector, Henry Wolf ’64, J.D. ’66, found a natural bond. “Even though there was a decade and a half between us, both of us had been economics majors at William & Mary, and we both studied law at Georgetown, where I received my graduate law degree,” Wolf says. “That period was characterized by a number of issues,” he says. “We’d had a financial collapse within the country that impacted William & Mary and the commonwealth.” As Wolf explains, the board was under pressure to raise tuition significantly, as well as increase enrollment. “Michael was sensitive to that. He was very concerned about affordability, and the ability of our matriculated students to bear the cost. 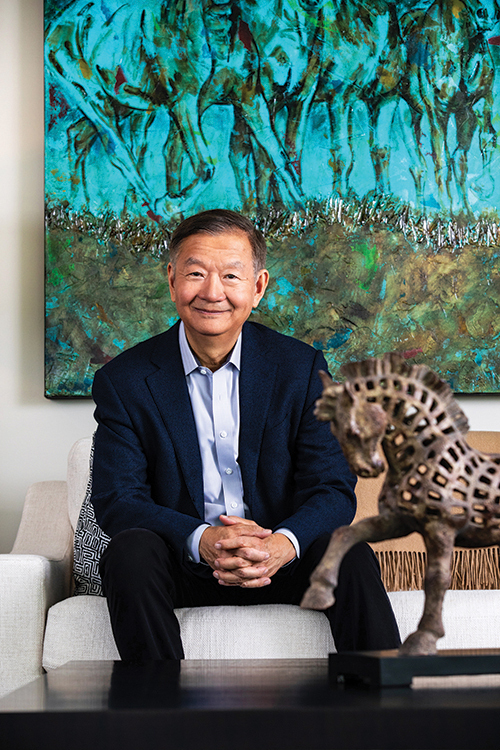 Extraordinarily generous in sharing his time and expertise, Tang also has made transformative financial gifts to a wide range of philanthropic causes. At William & Mary, he established the Tang Faculty-Student Research Endowment in 2008, and in 2013, presented a leadership gift creating the Tang Professorship in Economics. Currently a member of William & Mary’s For the Bold Campaign Steering Committee, Tang looks forward to showing off his hometown as honorary chair of the William & Mary Weekend in Chicago, June 1-3. Especially close to his heart is the Cyrus Tang Hall of China at Chicago’s Field Museum, a permanent exhibition that opened in 2015. Since then, the hall has hosted a million and a half visitors from around the world. As Tang explains, the project had special appeal to his father, Cyrus, because of its educational goals in introducing Americans, particularly schoolchildren, to the complex story of Chinese culture. Tang notes that the Museum came up with an ingenious way to tell that story. “One of the very first key decisions we made as a collective group was to arrange the exhibition by common life events and things that you see in cultures across the world, not just in China,” Strohmeier says. 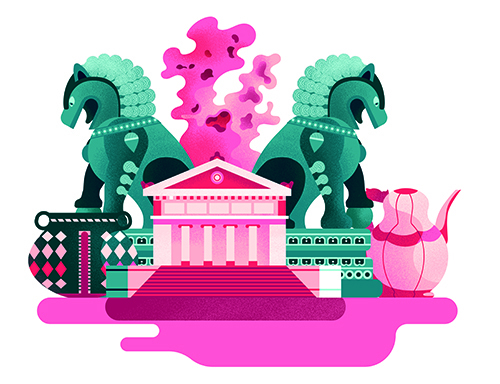 “That helps ground our visitors in making comparisons between what they know and what they’re learning.” Tang Hall, whose entrance is flanked by the Field Museum’s famed 13th-century stone lions, includes rare textiles, bronzes and ceramics, as well as a puppet theater featuring intricately cut Chinese shadow puppets. The final stop in the exhibition is a traditional Chinese dry garden, which gives visitors a chance to stop and reflect before moving on. Gracing the garden are spirit stones, fantastically shaped pieces of rock formed by the power of water. The Tang family worked to secure the donation of these spirit stones from Suzhou, Cyrus Tang’s birthplace — bringing the story of the Tang family and their remarkable achievements full circle. Proud of his hometown, Tang extols Chicago’s restaurant scene, blues clubs and beach volleyball. But no conversation with a native Chicagoan is complete without mention of the city’s fabled sports teams, including the Bulls, Bears, White Sox and especially the long-suffering Cubs and their fans. “Every year you don’t do well, you get resigned. But there’s also a seed of hope,” Tang says.